The SonarMite+ App is based on the free SonarMite App but offering additional features. The software is an Android App designed to work with the popular SonarMite Bluetooth Echo Sounder used in hydrographic surveying applications. With the demise of Hyperterminal as a standard terminal application the end user is left with little choice for a simple communications program with serial data devices. Connecting via Bluetooth is cleaner than USB cable, there are no wires and the connection is independent of baud rate and other serial port settings. Most terminal programs are not easily configured with commands to directly interface with instruments such as SonarMite. 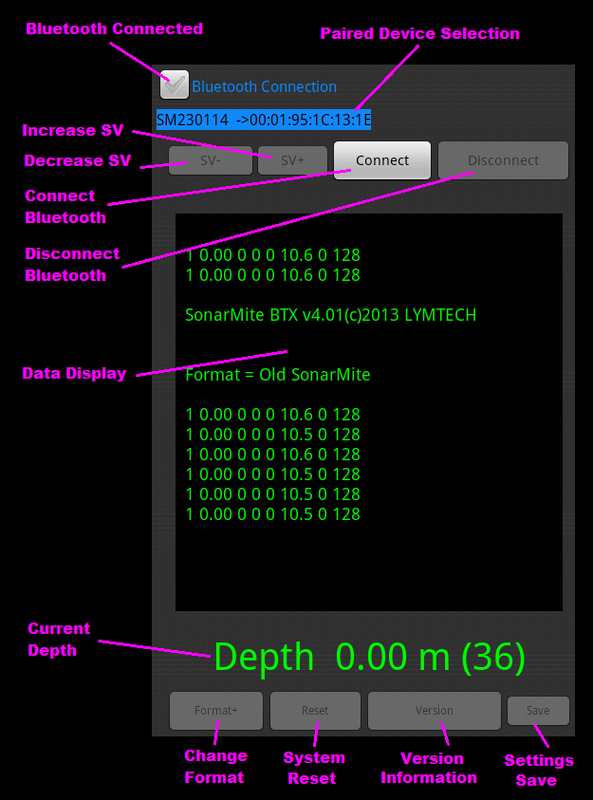 SonarMite App is an Android App designed to work with the popular SonarMite Bluetooth Echo Sounder used in hydrographic surveying applications. With the demise of Hyperterminal as a standard terminal application the end user is left with little choice for a simple communications program with serial data devices. Connecting via Bluetooth is cleaner than USB cable, there are no wires and the connection is independent of baud rate and other serial port settings. Most terminal programs are not easily configured with commands to directly interface with instruments such as SonarMite. The App is dedicated to connecting to the SonarMite and providing most simple commands via pre-programmed buttons. Dedicated buttons give a more intuitive interface than using the dropdown keyboard or voice interface. Buttons include ‘Format’ to change the data output format, ‘Version’ will show the current firmware version and ‘Reset’ will cancel any changes and set the instrument back to its default settings. 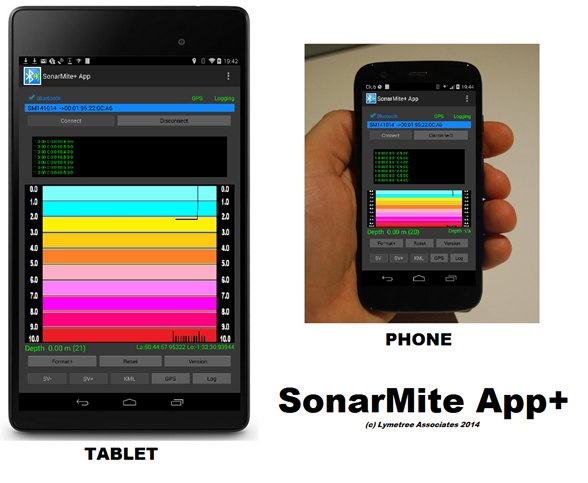 SonarMite is a simple App giving the user basic SonarMite display and control functions and supplied free of charge from the Google Play website. SonarMite+ has more advanced features and displays, this will be supplied for $100 from the Google Play website. There will be free email support but limited to the current version of the software and Android operating system.